In addition to its pumping, draining and septic services, Service Pumping and Drain operates its own wastewater treatment facility at its Northeast Environmental Processing LLC subsidiary in Lawrence, Massachusetts. The facility gives them a convenient way to process the food and grease trap wastewater they remove for their customers, often on a 24-hour emergency basis. That customer base includes 400 restaurants in the greater Boston area. The grease and other liquid wastes from these customers amounts to about 25,000 gallons a day. The wastewater facility separates fats, oils and grease, and prepares dewatered solids that can be composted, anaerobically digested, or incinerated. Some free oil is also recovered that can be converted to No. 6 fuel oil. When Vogelsang representatives initially visited them, a FOG unloading pump was at the head of the treatment plant. Vogelsang supplied a VX136-210Q pump, running at 250 gpm at 15 psi with 5 percent solids at 100 degrees F, pumping fats, oils and grease. Previous to this, the plant had tried two competitor’s pumps that did not last. One had issues with solids tearing up the gears. The other had continuous leakage along the shaft. 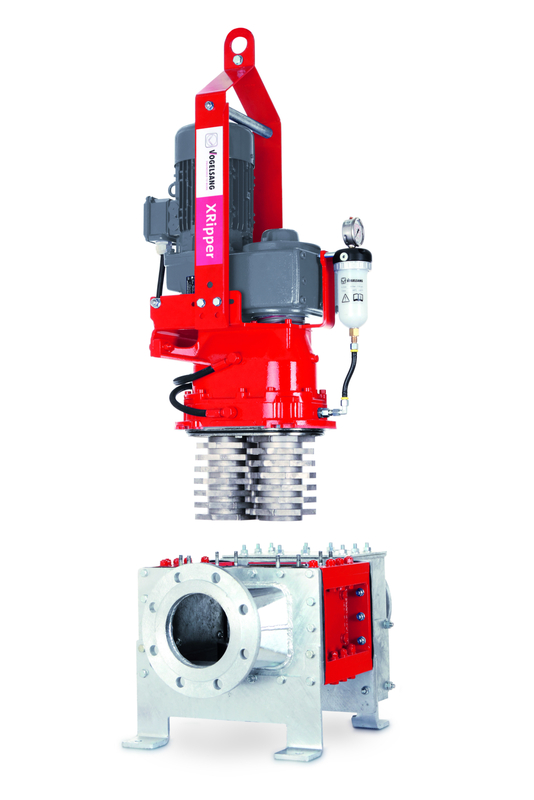 Because the company had worked with Vogelsang to install pumps at another part of the plant, they gave Vogelsang the opportunity to solve the problems in their unloading application as well. Immediately after the installation, Northeast Environmental saw positive results with smoother operation and extended maintenance times. Maintenance was also much easier on their Vogelsang pump compared to other pumps they had used. Solids did not affect the Vogelsang pump and there was no further leaking. A second pump was ordered. They also received a Vogelsang XRP136-200 Twin-Shaft Grinder with 4-inch flanges. They appreciated that Vogelsang engineering made the XRipper as easy to maintain as their pump. And with the XRipper in front of the pump, the worst solids were separated and reduced to allow their pump to operate even more efficiently. 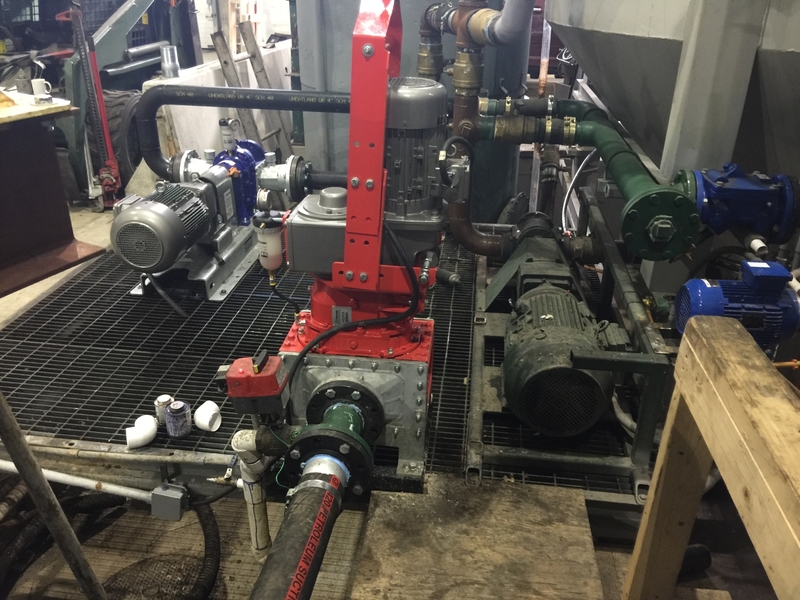 All in all, Northeast Environmental reports less downtime, fewer dollars spent on spare parts, and no need to continue to replace failing pumps that had plagued them before discovering Vogelsang. Northeast Environmental off-loads the trucks with grease trap waste collected from area restaurants. The FOG then passes through a cyclone separator that separates out most of the heavy solids. The lighter solids pass downstream. From the grinder, the FOG passes to the pumps where it is then distributed into tanks based upon what characteristics the FOG has. After that it is processed into a variety of products.